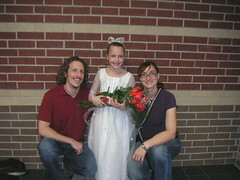 Here's me, my niece Mikah, and the child bride. Mikah is still dressed up from playing Clara in "The Nutcracker," and as you can see, she is the cutest little girl in America. Behind the smiles of me and Rachel are two people who will do horrible, horrible things to anyone who is ever mean to Mikah. My niece was surprisingly good in her role. 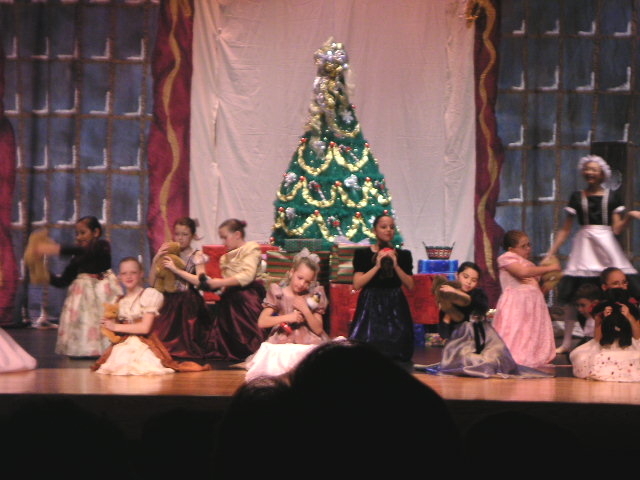 Here's another picture of her -- note that she is the cutest one on stage. 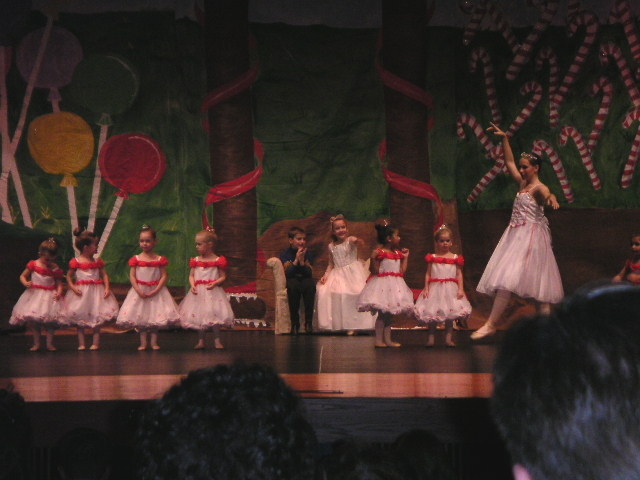 In the second part of the show, Clara does little more than watch other dancers. In this particular production, the only reason to watch the dancers was because you were related to one of them -- it dragged on and on and on. The highlights included one little girl with a penchant for falling to the ground with a stunning lack of grace, and another little girl who got out onto stage and decided she couldn't be arsed so she sat down. Those of us in the audience were able to sink down in our seats and close our eyes through certain less-exciting parts, but Mikah had to sit at the center of the stage and pretend that she cared. She did this amazingly well via a good deal of enthusiastic pointing. The boy who played the Nutcracker Prince often seemed more interested in smelling his hands, but Mikah kept him in line by occasionally jabbing him in the ribs. My niece is the best niece ever. While your niece, is, undoubtedly, VERY cute, I obviously must take exception to your claims since MY niece happens to be the cutest ever. I suspect this is an issue upon which you and I will never see eye-to-eye, especially because you're taller than me, and because you live in a different state. Nor shall we ever see blog-to-blog on it. That's OK, I'm comfortable with a diversity of opinions - you can always choose to be wrong if you want to! Clearly the only way to solve this is with a good ol' fashioned niece duel.